Last month we showed off 'Splosion Man, but with limited gameplay information at the time. 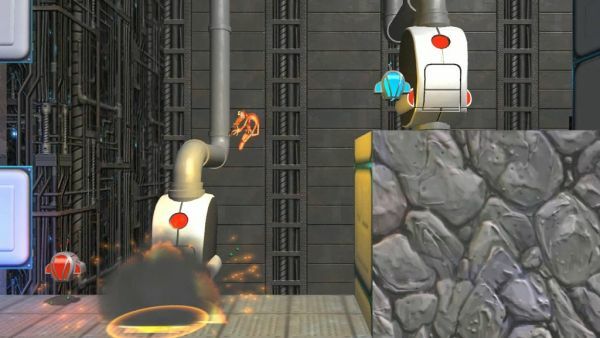 Now, the developers sent out a video with commentary on the demo of the game at E3, showing us what to expect with 'Splosion Man's 4 player co-op through over 100 levels in the game. Buckle your seat belts for this one, it's a pretty wild ride! Humor in this game seems to be at the forefront with quirky characters, and hilarious cinimatics which had all of the demo players laughing as they played. Aside from the usual running-jumping platform action, 'Splosion Man gets to propel himself over obstacles by exploding, or use that explosion tecnique to take out enemies in his way. With the fast paced action, 'Splosion Man has to think fast to make it through certain areas, and why not laugh maniacally while he's at it? Something that will make pop-culture fans drool a little bit, is the various references seen throughout the game. Including but not limited to, a the Batman screen wipe as their loading screen, Superman jump during certain explosions, and some movie lines to make us giggle. Check out the video to see if there are any specific references that you notice, or just let us know what you think of it! Page created in 0.6492 seconds.